We’re a gluten-free casein-free (dairy free) house and a couple years ago we added corn to the list of no-nos. There is a very interesting article by Mark Hyman over on HuffPo about common food allergies like gluten, dairy, eggs, corn, yeast, and peanuts and sometimes soy and how there seems to be a relationship between weight gain (or difficulty losing weight) and eating foods you are somewhat allergic to. I know that I rapidly lost 65 pounds (a 25% weight reduction) when I went on a gluten-free dairy-free diet and I’ve only gained 10 pounds back in the last 12 years since. Our son has been having serious acne lately and we’re going to experiment with eliminating peanuts for a couple weeks and see if that has any positive impact. 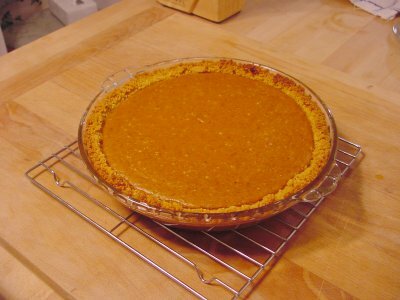 As the holidays are approaching I thought I’d share our favorite pie crust recipe. This is also available at my GFCF Pumpkin pie page. Cut in margarine and shortening until mixture resembles a course meal. Add egg yolk, water, and vinegar. Wrap dough in plastic and press into a ball. Chill for 1 hour. Between two sheets of plastic wrap, roll dough out into a 12-inch circle (about 1/4-inch thick). Remove top sheet of plastic wrap and flip pastry onto a 10-inch pie plate. Keeping the plastic wrap over the top of the crust, pat it into the pan, piecing together any parts that separate when the crust lands in the pan. Remove the second sheet of plastic wrap. Crimp edges. This entry was posted by Dan Swearingen on Tuesday, November 3rd, 2009 at 1:45 pm	and is filed under Diet & Exercise. You can follow any responses to this entry through the RSS 2.0 feed. Both comments and pings are currently closed. Enter your Email to subscribe to new posts as they are published.